If you don’t know the name Loïe Fuller, you aren’t alone. Even if you’ve seen the art form she’s created, the Serpentine Dance, the videos which attempt to memorialize her artistic contributions are only imitations. Fuller was never captured on film, despite becoming one of the most famous artists of her day. The Serpentine Dance was an avant-garde art form which used fabric and experimental lighting design to create an abstract figure of grace and beauty, rather than the female form. An artist, inventor, technician and teacher, it’s been debated if she can be called a dancer, despite the agonizing struggle she put her body through to create her images on stage. That struggle and tense relationship with Isadora Duncan is captured in Stephanie Di Giusto’s directorial debut The Dancer, which stars Lily-Rose Depp, Mélanie Thierry, Gaspard Ulliel, Amanda Plummer, Denis Ménochet and singer-songwriter Soko as Loïe Fuller. Lesley Coffin: There is so much debate throughout the film regarding whether she can be defined as a dancer. What inspired you to make that the title? Lesley Coffin: Were contemporary critics talking about the difference between Fuller as an artist and Duncan as a dancer? Stephanie Di Giusto: Absolutely. As far at the critics who wrote about Loïe Fuller’s work, there were some brilliant, poetic writings about her work that were very important to me. She was able to combine dance for a general popular audience and an elite audience. The most fascinating part of my own research was to compare Loïe’s autobiography and Isadora Duncan’s. Loïe Fuller autobiography, she wrote herself, so it truly comes from within. It’s about a little farm girl from the west, so there’s a clumsiness that comes through on the pages. She includes all these anecdotes and you can feel this very generous person. And she’s a woman so shook up by her encounter with Isadora Duncan that she wasn’t even able to name her. She only refers to her as the American. On the other hand you have Isadora Duncan’s autobiography, written by a ghostwriter. And you see a woman absolutely controlling her persona. She recounts her encounter with Loïe Fuller’s company with a tremendous amount of contempt. She calls them a group of hysterical women who weren’t really dancers. And Loïe Fuller wrote that when people would ask Isadora Duncan about her, she’d claim she had no idea who she was or didn’t remember her. Lesley Coffin: Did you see any connections between Fuller’s artistry on stage and the visual artists in Paris in that period? Stephanie Di Giusto: No, what made her so revolutionary, so important was what she brought to France. Before her, this avant-garde in France didn’t exist. She was a precursor to abstraction. We can go further, into something like architecture. Art historians say that in Nouveau, the curves were brought by Loïe Fuller. She’s the origin. Sculptors found it very difficult to sculpt her, however there are many sketches and paintings of her, including many by Toulouse-Lautrec. She arouse an interest on the part of artists. Lesley Coffin: Did you use those pieces as inspiration for how you film her performances? Stephanie Di Giusto: Everything is based on something we found. However we don’t point out specific pieces of art or the celebrities who created them. Because I didn’t want to create a traditional biopic, I wanted to make a very intimate film. Lesley Coffin: Is that one of the reasons you added fictional characters such as Louis? Stephanie Di Giusto: Yes, but you should know that in real life, she was married to an American banker who gave her money to create her first shows. But she divorced him when she realized he was already married. She was constantly disappointed with the men in her life. Her father was murdered, this man betrayed her. But what I was interested in with the character of Louie, was to confront Loïe with her sexuality. Louis represents the dying aristocrats, men stuck without ambition or goals. Stuck in time, and when she meets him, she’s really meeting a ghost. And when he meets this avant-garde woman, she’s already in the future while he’s stuck in the past. Lesley Coffin: Gabrielle and Isadora seem to be the two extreme side of womanhood Loïe us wrestling with throughout. Did you think of the three of them representing a different aspect of the feminine image? Stephanie Di Giusto: For me, and this is also fact, Gabrielle was the love of Loïe’s life. They are the couple at the heart of the film. In her autobiography, she explains that she isn’t interest in sexuality, and the passion they share goes beyond that. Gabrielle shared her passion for Loïe’s art. They don’t go all the way with their sexuality. Louie is impotent in the film. The only person in the entire film to embody desire is Isadora Duncan, who will betray Loïe. Lesley Coffin: I noticed you always filmed her dances in extreme wide shot, except when you went to extreme close-up on her face. And you really show the juxtaposition between the soft, graceful image she created and the gross, physical exertion she put herself through. How did you decide on that visual approach? Stephanie Di Giusto: For me, it was really important to showcase the spectacle she created. And spectacle requires an audience to have distance from the performer. I really wanted the audience in the theater to have the same experience, to see the vision of femininity she created on stage, of a woman who was inaccessible. And then in real-life, I wanted to feel as close as possible, practically smelling her arm-pits, and show her like a boxer. I had that desire from the moment we started writing, to respect that contrast. Lesley Coffin: When thinking about how to tell her story, was there an aspect that made her work cinematically? Stephanie Di Giusto: I feel this movie is about the history of cinema. It’s the beginning of cinema. If I had to choose someone who embodies cinema, I wouldn’t choose a director, I would choose her. And what’s very strange about her is, she knew Thomas Edison very well, but always refused to be filmed. All the little films you see on YouTube are imitators. She used to say, I don’t want to be locked into those wood boxes. Lesley Coffin: But she did make her own film? Stephanie Di Giusto: Yes, you can find it in black and white. It’s an extremely modern, avant-gardist film where you see her students in their floating robes. 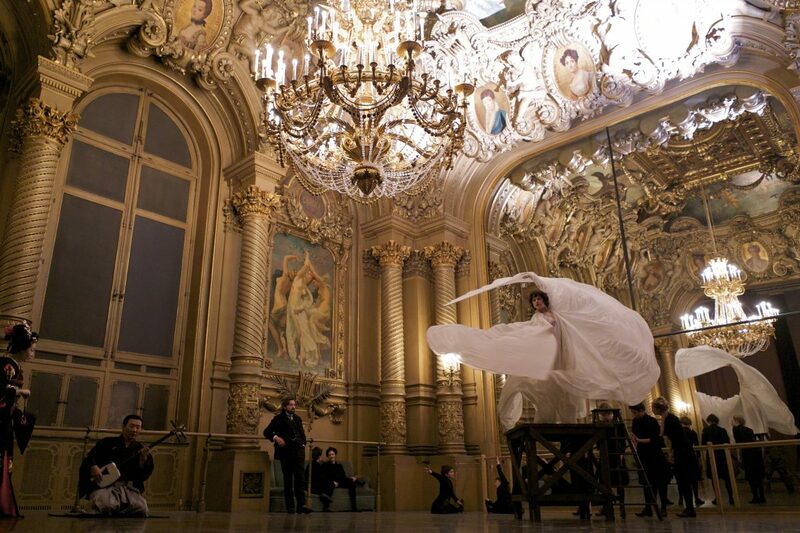 And when Loïe Fuller died, Gabrielle took over for her and she also made films. Lesley Coffin: You include the conversations about how well she’ll be remembered, and the audience always has in the back of their head that she really won’t be, at least by name. And especially compared to Isadora Duncan. Stephanie Di Giusto: I think on a deep level, she was a woman who did not like herself and would prefer to spend time with her technical crew than go out and work on her public image. She put her art before her personality. Isadora Duncan was a communication animal, constantly controlling her image. Constantly cultivating the image she wanted the public to have of her. And I imagine, although this is only my supposing, that is the reason she has a beautifully maintained grave with gold letters. Whereas Loïe Fuller had her name plate stolen from her destroyed grave. She will have had everything stolen from her to the very last. Lesley Coffin: She certainly isn’t known in the US, is she better known in France? Stephanie Di Giusto: No, the idea for the film was to make her known again. Lesley Coffin: Did the public have any idea of how strenuous her performances were or did she keep that hidden to maintain the spectacle? Stephanie Di Giusto: That’s a good question, but I’m not sure I can answer. We know that after every performance she had to lay down on stretcher. And she only danced every three days because she needed time to recover. But all that was behind the curtain. She didn’t complain a lot so it’s possible the public didn’t know. She was a very generous person because she didn’t teach her student her dance, the strenuous one. She taught them how to dance freely. She said she would like her students to dance how they speak. Lesley Coffin: Did her school of dance live on? She reminded me of the work of someone like Martha Graham. Stephanie Di Giusto: Absolutely. With these students, she generated a state of mind, which would have been passed on to women like Martha Graham. In Paris, there was a show at the Pompidou Museum, about the history of dance, called dance your life. And there was an entire room devoted to Loïe Fuller. Lesley Coffin: I know you fictionalized some elements of her parents. Why make those changes? Stephanie Di Giusto: The part to do with her father being French was made for a very practical reason. From the very beginning I wanted Soko to play the role, I couldn’t imagine anyone else, and I didn’t want to force her to use a fake American accent. But aside from her nationality, I really didn’t change anything. He was a gold miner, he raised cattle in the west, and he was an adventurer. She talked about him a lot. In her autobiography she wrote there were two tragedies in her life. The first was the death of her father, and the second was her encounter with Isadora Duncan. So we start the film at the death of her father, and end with her encountering Isadora. He really was murdered. Her mother really was extremely was religious and part of the Mothers. However she followed her daughter to Europe, but was a rather banal character. She was devoted to her daughter. But I didn’t want to get weighed down by a banal character, so I left her in America. Lesley Coffin: You choose to include the fact that she was part of the mothers, a group of suffragettes who opposed her art form. They were an early feminist group who disagreed with certain form of female self-expression. What was Loïe Fuller’s relationship to feminism? Stephanie Di Giusto: She was a feminist despite herself. There was no will on her part to affirm or fight for anything, she was just passionate. She was a being of impulse. On the other hand she did have ideas about the freedoms of women, at a time when women only had two fates. They could become a prostitute or become a housewife. She symbolized this different idea about what a woman could be. Lesley Coffin: What motivated you to choose Soko. What made you believe she was the perfect woman to embody this character? Stephanie Di Giusto: Simply because I find Soko to have a femininity outside the norm. She has a contrast between strength and sensuality. She can be banal and spectacular all at once. She has this contrast I think Loïe Fuller had too. She’s also an artist and I knew that aspect of her would dialogue with the character. And I know she’s an actress who does not cheat, she doesn’t fake anything. And I knew she would go all the way with Loïe Fuller’s suffering, which she did. Read FF2 Media’s review of The Dancer HERE.